Palm Isles in Boynton Beach is a sprawling, resort-style community that welcomes residents aged 55 or better. Built by Oriole Homes, Palm Isles consists of condos, attached villas and single-family homes available on a resale-only basis. This gated neighborhood offers well-appointed amenities perfect for an active adult lifestyle. In addition to the impressive amenities offered on-site, Palm Isles surrounding area provides plenty of shopping, dining and recreational activities. Close proximity to major roadways make it easy to explore the nearby areas and make it safely back home again. Palm Isles’ 50,000 square-foot clubhouse offers recreational activities as well as amenities to support an active and social living. The 600-seat performing arts theater hosts a variety of exciting shows. The Palm Isles Cafe is the perfect place to meet neighbors while getting a snack. The multi-purpose room is an ideal space for a variety of community events. Residents can express their creativity in the arts and crafts studio or meet up for a fun game of billiards or cards. Those interested in fitness will be impressed with Palm Isles’ exercise facilities. The state-of-the-art fitness center includes strength and cardiovascular machines. Afterwards, homeowners can relax with a swim at the indoor pool. Outdoors, a second swimming pool is surrounded by a large patio, which is perfect for soaking up some sun or lounging poolside with friends. A shaded area also lets residents stay in on the action while taking a break from the sunshine. In addition to swimming, residents can enjoy eight Har-Tru tennis courts, pickleball courts, six shuffleboard courts, and the beautiful gazebo for sunset views. Palm Isles is a beautiful active adult community which contains 2,367 residences, in a wide range of floor plans and design styles. The residences offered are condos, attached villas and single-family homes available on a resale-only basis. Condos offered in Palm Isles range from one to two bedrooms, one-and-a-half to two bathrooms, and provide assigned covered parking. These models offer the ultimate in low-maintenance living. Attached homes in Palm Isles offer great living for those looking to downsize without losing functionality. These homes range from one to two bedrooms, one to two bathrooms and an attached one-car garage. Active adults love these models for their open floor plans and low-maintenance exteriors. Single-family homes in the community range from two to three bedrooms with two to two-and-a-half bathrooms and an attached two-car garage. These models are great for their private master suites and convenient first-floor living. Palm Isles has plenty of activities to keep residents entertained. Homeowners are involved in the community and enjoy taking part in many social clubs and activities. Some of those clubs and activities include art, billiards, golf, tennis, movie society, chess, clay sculpture, fishing, dance, creative writing, and bridge. There is also a full-time activities director on staff to help residents plan events or organize day trips to make the most out of living at Palm Isles. Set in Boynton Beach, Florida, Palm Isles is only a short drive from the beach and other local attractions. Just west of the development, active adults can explore the natural beauty of the Loxahatchee National Wildlife Refuge, while to the east residents can enjoy relaxing on the ocean shore. There are also plenty of shops and restaurants, as well as nearby golf courses like the Indian Springs Golf Club, Pine Tree Golf Club and The Links at Boynton Beach Golf. Palm Isles is not far from major roadways, such as Interstate 95 and Ronald Reagan Turnpike. This makes it even easier to travel throughout the surrounding areas. Residents who frequently travel or have out-of-town guests will also appreciate living within 30 minutes of the Palm Beach International Airport. 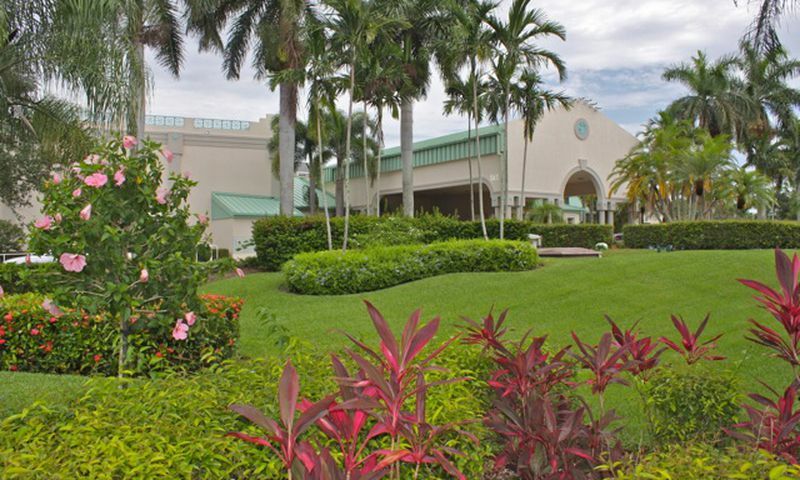 Palm Isles is a great 55+ community that offers resale homes and well-appointed amenities in Palm Beach County, FL. Clubhouse - 50,000 Sq. Ft. There are plenty of activities available in Palm Isles. Here is a sample of some of the clubs, activities and classes offered here. Condos offered in Palm Isles range from one to two bedrooms, one-and-a-half to two bathrooms, and assigned covered parking. These models offer the ultimate in low-maintenance living. Please Note: Floor plans are not available at this time. Attached homes offer great living for those looking to downsize without losing functionality. These homes range from one to two bedrooms, one to two bathrooms and an attached one-car garages. Active adults love these models for their open floor plans and low-maintenance exteriors. Please Note: Floor plans are not available at this time. Single-family homes in the community range from two to three bedrooms with two to two-and-a-half bathrooms and an attached two-car garage. These models are great for their private master suites and convenient first-floor living. Please Note: Floor plans are not available at this time. Palm Isles is nice for single people who want a safe community in a convenient location with low-maintenance homes. I have a small condo here where I don't have to worry about maintenance so I can spend more time with my friends. I try to keep myself busy with my clubs and activities. There is plenty of variety to keep my calendar full whether I have something special going on or I'm just being lazy at the pool with a good book. 55places.com is not affiliated with the developer(s) or homeowners association of Palm Isles. The information you submit is distributed to a 55places.com Partner Agent, who is a licensed real estate agent. The information regarding Palm Isles has not been verified or approved by the developer or homeowners association. Please verify all information prior to purchasing. 55places.com is not responsible for any errors regarding the information displayed on this website.